Fun With Frisian: OARS AS OARS - "Different From Usual"
OARS AS OARS - "Different From Usual"
The title of the post is probably misleading, as this blog regularly delves into Frisian-language music. Today, let's look at "Fries Om Utens," a song about loving and missing Friesland. The video includes lyrics along with the singing. Part of the song is in English. "Fries Om Utens" video on YouTube with lyrics. Wier means "truth" and is pronounced like the English word "veer." Hiel oars as oars - entirely different from usual. Hiel was discussed in an earlier post. Oars is handily pronounced like the English word it resembles, though it means "other" or "another." As takes a long "a" like in father and means "as," or "like," or "resembling" in this context. It has broader uses, however, including "if, "in such a way," "how," etc. Fan hâld is a phrase meaning "to love." E.g., "Ik hâld fan dy" means "I love you" in West Frisian. Nei dy. The word nei, said like "night" without the final -t, comes up in many phrases. It can mean "for" or "to." 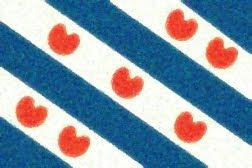 E.g., from the chorus: Fryslân o Fryslân, ik longerje nei dy... "Friesland, oh Friesland, I long for you." You can also use nei if you are going somewhere: e.g., nei hûs, "to house/home," from the chorus. The song title means "a Frisian who lives abroad." Wholly different from usual... I understand well. No place I can love so (much as I love you). I steal hearts, the others' pain. I make friends; lose a pair. Because I long for you so much. And my thoughts always stay close to you. Friesland, you call me: yes, I want to go home. Friesland, oh Friesland, I long for you. Oh Frisian ground, you give me bread. The green meadows, the scent of hay. That is my picture of time. Tell stories, sing of your land. It is where in early times my life began. That I myself am not (there) today. Caledonia by Dougie MacLean. Wonder if they got permission to borrow his song? The tune of the song sounds Irish.